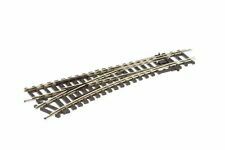 Very good quality used nickel silver Hornby R8073 Right Hand Points. All sleepers and fishplates 100% intact. Each point is fully springed with a good springing action. 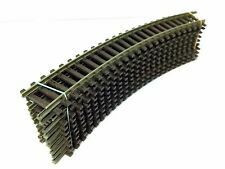 You will also receive a nickel silver Hornby R606 curve with every set of points. Rail surfaces have been cleaned and have a good bright finish and most sleepers have lost their sheen giving a more natural weathered appearance. Goods will be well protected. 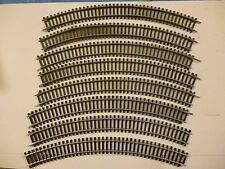 This is a set of eight Hornby 00 double second radius curves R907. They are nickel-silver and in excellent condition. The eight double curves form a circle. 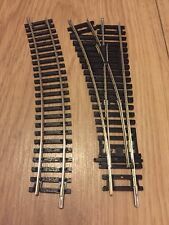 Very good quality used nickel silver Hornby R8072 Left Hand Points. All sleepers and fishplates 100% intact. Each point is fully springed with a good springing action. 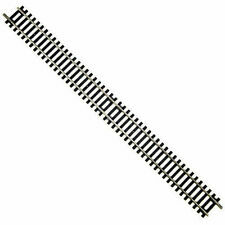 You will also receive a nickel silver Hornby R606 curve with every set of points. Trakmats are always best used glued to a baseboard. Condition Unused. UK despatch only. Goods will be well protected. 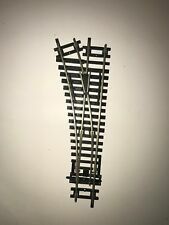 I was the original designer of the Lightwork Ballast Spreaders which were compared by Model Rail Magazine against all the popular makes and was awarded the top marks above all of the others. These will not have a sleeve but are new and unused. The points are in good used condition with strong switching action. UK despatch only. Goods will be well protected. Pre owned in good order. 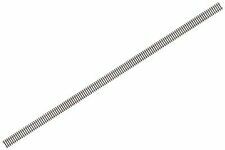 Item Hornby 00 Gauge R641 Steel Right Hand Curved Points. These are older points which have good rail surface but may have tarnishing to the rail sides. Sleepers are dull having lost their sheen giving a more realistic weathered appearance. Free local collection. See them here . Rest of World Australia,USA, etc.£19.50. 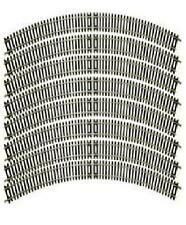 This 'Buy it Now' is for 8 pieces of New, Hornby R609 Nickel Silver 3rd Radius Double Curves, taken from train sets. I have just been advised that my photo actually show 9 pieces, not 8, but this 'Buy it Now' is for 8 pieces. 2 are used on each hornby point. 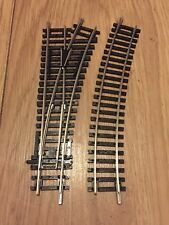 Hornby OO gauge R601 x2 & R600 x5 nickel silver straight pieces of track, listed as used but as new, all sleepers and fish plates intact. EXPO 74300 - LOCOMOTIVE LUBRICATING NEEDLE POINT OILER - SAFE ON PLASTIC - NEW PLASTIC TUBE with POCKET CLIP. 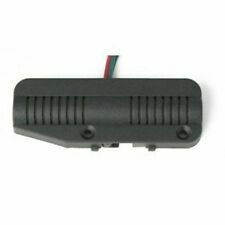 Specialy formulated for model railway use. VERY GOOD CONDITION.WITH ALL RAIL JOINERS AND INSTRUCTIONS. ALSO, IF A BOX IS INCLUDED IT WILL BE SHOWN IN PHOTO. 8 x R8072 Left point & 8 x R8073 Right point. Hornby 00 gauge. Hornby electric turntable OO gauge tested & works R070 access tracks inc.